I don’t have nightmares, thankfully. Some strange and surreal references to ancient Mayan culture appear in my dreams though. It feels good to wash them away in the shower, and a hearty breakfast leaves both the gf and myself wondering just how many pounds we’ve both put on these last few days. We reassure ourselves that all this walking will burn off the calories but the stretching of my pants seems to tell another story. If you talk to anyone about Scarborough and Whitby they will tell you to go to Robin Hoods Bay. After struggling with bags, helmets, jackets and boots yesterday I make a brave and bold decision. We’re going on the BUS! Yes, that’s right, a bus. According to the well informed landlady the Scarborough bus will pass through Robin Hoods Bay every half-an-hour. If we go on the bus we can leave all the gear here, except for a bag each. We can walk around, take in the sights and lounge on the beach, safe in the knowledge the bike and gear is locked up tight in the guesthouse. The first issue we come across is at the bus station. The massive queue. It’s obvious which stand is for the bus going to Robin Hoods Bay, it’s the one full of tourists with the same idea as me. We join the queue and after 10 minutes the bus arrives, already full. Many people get off but even more people get on. I nearly walk back off again when the driver tells the gf its £12 for 2 returns to the Bay. I suppose it’s a long time since I caught a bus, I suppose I’m tight, but I’m struck dumb and say nothing. On the bus it’s standing room only and by the time we pull out of Whitby even the aisles are rammed full. Standing on the bus we bounce and wobble our way through 6 miles of countryside. Standing up it’s a long and dangerous 6 miles as I bump into people in seats and drop my bag whilst trying to hold tight. The good thing is the bus does drop us off right at the top of the hill, only a short walk from the very steep road through the town to the beach. 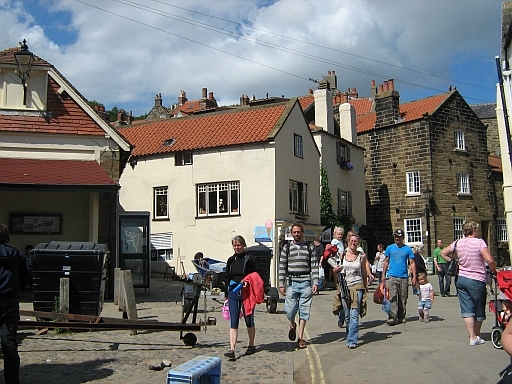 Compared to the tiny hamlet of Runswick Bay, Robin Hoods Bay is enormous. In reality it’s a small village, the old village runs down the steep road to the jetty and a more modern collection of houses and guesthouses sit on top of the bluffs overlooking the old village. 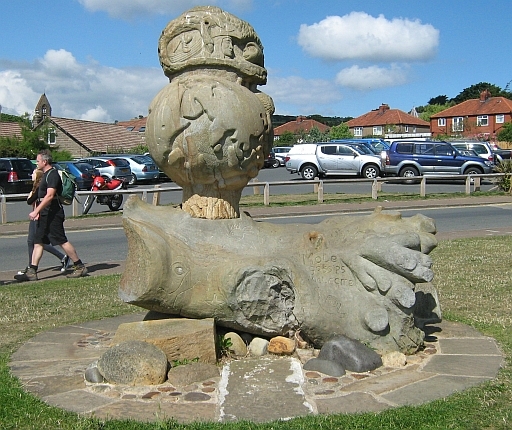 At the start of the steep incline there is a car park for the plentiful tourists and a most surreal and unusual stone carving that fails reasonable description. 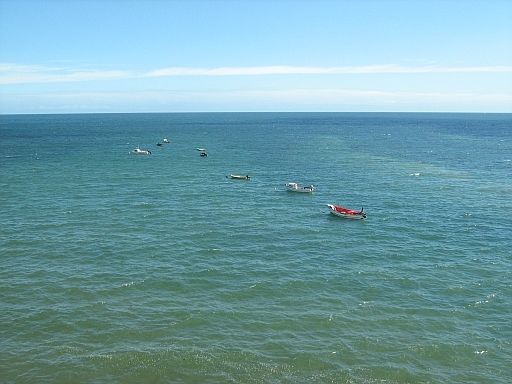 We stop and look out over the sea and across the bay. The weather is warm now with the odd glimpse of sunshine between the light clouds and it feels so good to be dressed light and not be weighed down with helmets and boots. The strange and inexplicable sculpture in Robon Hoods Bay. Later research tells me it has something to do with the Millenium, but I can't see why. As we walk down the steep road we detour into the tiny alleys and walkways. These routes are barely wide enough for walking yet have street names, I can only assume they are classed as roads. 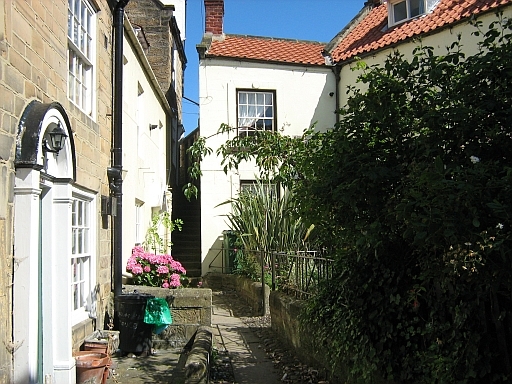 There are tiny cottages, hidden cafes, a shop no bigger than a dining table and gardens large enough only for a wheelie bin and a potted plant. In between the cottages there is the occasional view of the sea before we have to duck under another hanging basket. Very narrow streets must make this place feel like living in a rabbit warren. Fascinating. We head downhill, logic dictating this will take us to the sea. Back on the steep road we re-join the countless visitors and at the lifeboat station we take a brief look at the historical and geological displays in a tiny visitor centre. Another flight of wooden stairs takes us up then down to the beach. Of course it’s busy and bustling yet inside my head I feel as though we can relax here for a while and just chill out, take it easy and listen to the small waves as they lap against the shoreline. Tourists and holidaymakers at the bottom of the steep road. Don’t be silly! I think even after 20 minutes the gf is already bored. It’s too busy and too bustling to relax even for her. We make our way over the steps and meander slowly back up the hill. We investigate some more narrow lanes and stop for tea in a hidden café that overlooks some tiny boats tethered in the bay. We talk about Robin Hoods Bay and decide it will be much better out of season, but it’s definitely worth a look. Small boats bob in the beautiful blue-green sea off Robin Hoods Bay. It looks georgeous...moments later we did get a few spots of rain though. Who says the camera never lies. I’m expecting a long queue at the bus stop, but there is no-one else. We look at the timetable and there’s only another 10 minutes to wait so I try to position myself where I guess the front of the queue will form. No need. Only one other couple join my imaginary queue by sitting on the bench nearby. When the bus arrives there are a sprinkling of passengers but the choice of seats is ours to make. Of course I choose the wrong ones and the gf has to put me right. It’s the final night of our trip tonight, perhaps we should do something special. Maybe we should have a nice meal in a posh restaurant or a romantic candlelight supper? It’s no surprise to the gf though when I take her to a café. She has a baked potato and chilli, I have a cheese sandwich. She seems happy with this, we were both feeling fat and both needing something tasty yet not too heavy. This meant that after we had dined we were still ready to climb the 199 steps that lead up to Whitby Abbey. The steps are in the old side of town. As we walk through the gf, being an artist, spots a gallery. We peruse through the window and discuss prices and I’m impressed by one painting of an old sailing ship. A little further down people in medieval costume are gathered around an accordion player for some unexplained event. As we walk up the 199 steps I count each one. At the top I’ve only counted 198, the gf has 199. I suspect I’m in error and she has cheated. 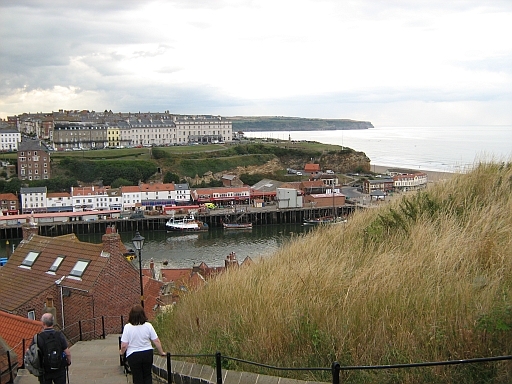 Whitby Harbour looking from the 199 steps. Whitby is much quieter tonight. The Abbey is closed at this late hour. From outside the walls we can take some pictures and gain access to the grounds of some once grand mansion, now part of the Youth Hostel. The Church of St Mary the Virgin has a large graveyard and we spend a while looking with interest at the gravestones. 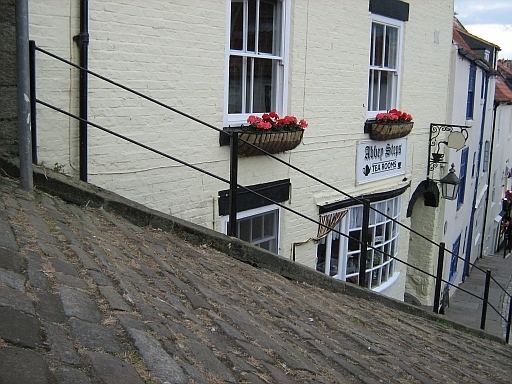 Next to the 199 steps is a cobbled road. We walk down, amazed at how steep it is. As we walk further it gets steeper and steeper and steeper until at the very end it must surely be at 45 degrees. We agree it would be most impressive to get a modern 4x4 up here, let alone a donkey with a load of fish on its back, probably the original purpose of the road. No...really...it is THAT steep. Check the drain pipes, sign-post and railings, they are vertical. By the time we’ve walked back to the harbour my feet are tired and I’m ready for a rest. I’m incredibly angry with myself when I realise I’ve forgotten my wallet and will have to walk back to the guesthouse to get it, walk back into town to get cash to pay for our stay then walk back to the guesthouse. I keep my temper and inform the gf, I insist she stay at the digs and I’ll make the trip myself. She’s having none of it. So grudgingly we walk back into town and to the cash machine to get finances. Quite jokingly I ask the gf if she’d like to see what’s up that back street. I curse to myself when she says yes. We detour through some gardens and municipal grounds whilst my feet scream at me to stop. By the time the guesthouse comes back into view I’ve given up trying to ignore my feet and feel strangely better for this. I lie there on the bed for a while, relishing in the nakedness and coolness of my tortured feet. I never was a great walker. Tonight I’m going to choose the video, something less horrific and more light hearted than last night’s movie. I spot “Hot Fuzz”, that’s supposed to be fun. We spend the remainder of the night watching a great British movie before we settle in.